We used to think that the trouble countries in the euro zone were what has been called the PIIGS (Portugal, Italy, Ireland, Greece and Spain) and then suddenly Cyprus comes along and blow up. So now everybody is looking for the ‘next Cyprus’ rather than the next Spain or Greece. So now all eyes are turning to Slovenia as it is again and again has being mentioned as the ‘next Cyprus’. I would, however, strongly argue that Slovenia is not Cyprus. That might sound good. Unfortunately it is not Slovenia, which is the ‘outlier’ – it is Cyprus. I think it is really simple – the countries in the euro zone which are in the biggest trouble – risk of sovereign default and potential banking crisis – are the countries that have seen the largest drop in nominal GDP since 2008. The graph below illustrates this very well. It shows the relationship between the change in NGDP from 2007 to 2012 and the change in public debt ratios (debt/NGDP) in the same period. 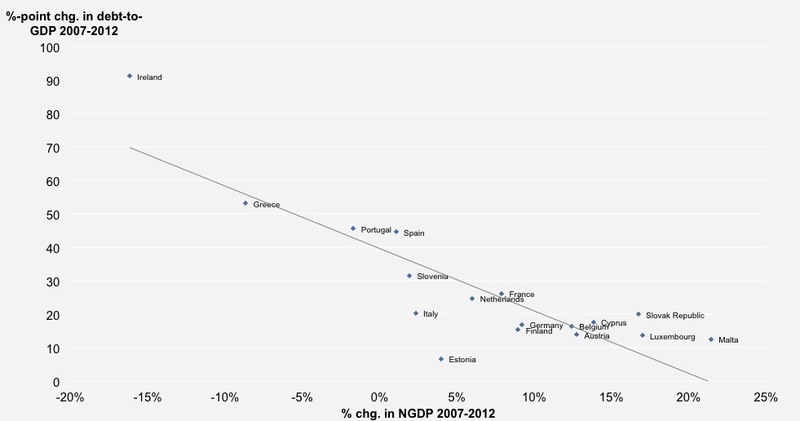 Surprise, surprise the countries that have seen the biggest increase debt ratios happen to be the PIIGS and those are also the countries that have seen the biggest drop in NGDP during the same crisis. But notice Cyprus. Cyprus hasn’t really seen a major drop in NGDP and the increase in the debt ratio is not alarming. Cyprus is the ‘outlier’ – despite of banking crisis and a potential sovereign debt default the economy has been holding up pretty well (so far!). Cyprus is in trouble not because of the Cypriot economy as such, but because of a few banks’ exposure to Greek sovereign debt (this is likely a result of moral hazard). That is the story Cyprus, but it is not the story of Slovenia. It is therefore wrong to say that Slovenia is Cyprus. Unfortunately it might be worse – Slovenia is the second ‘S’ in PIIGSS. PS For those who are unable to differentiate between Slovenia and Slovakia – you have no reason to worry about Slovakia. The country is doing remarkably well.